Abstract. In order to assess the potential of the honeycomb oyster Pycnodonte vesicularis for the reconstruction of palaeoseasonality, several specimens recovered from late Maastrichtian strata in the Neuquén Basin (Argentina) were subject to a multi-proxy investigation, involving scanning techniques and trace element and isotopic analysis. Combined CT scanning and light microscopy reveals two calcite microstructures in P. vesicularis shells (vesicular and foliated calcite). Micro-XRF analysis and cathodoluminescence microscopy show that reducing pore fluids were able to migrate through the vesicular portions of the shells (aided by bore holes) and cause recrystallization of the vesicular calcite. This renders the vesicular portions not suitable for palaeoenvironmental reconstruction. In contrast, stable isotope and trace element compositions show that the original chemical composition of the foliated calcite is well-preserved and can be used for the reconstruction of palaeoenvironmental conditions. 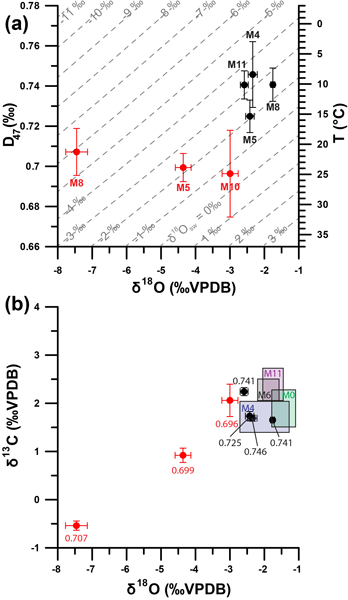 Stable oxygen and clumped isotope thermometry on carbonate from the dense hinge of the shell yield sea water temperatures of 11°C, while previous TEX86H palaeothermometry yielded much higher temperatures. The difference is ascribed to seasonal bias in the growth of P. vesicularis, causing warm seasons to be underrepresented from the record, while TEX86H palaeothermometry seems to be biased towards warmer surface water temperatures. The multi-proxy approach employed here enables us to differentiate between well-preserved and diagenetically altered portions of the shells and provides an improved methodology for reconstructing palaeoenvironmental conditions in deep time. While establishing a chronology for these shells was complicated by growth cessations and diagenesis, cyclicity in trace elements and stable isotopes allowed for a tentative interpretation of the seasonal cycle in late Maastrichtian palaeoenvironment of the Neuquén Basin. 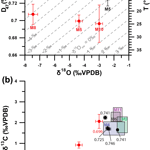 Attempts to independently verify the seasonality in sea water temperature by Mg∕Ca ratios of shell calcite are hampered by significant uncertainty due to the lack of proper transfer functions for pycnodontein oysters. Future studies of fossil ostreid bivalves should target dense, foliated calcite rather than sampling bulk or vesicular calcite. Successful application of clumped isotope thermometry on fossil bivalve calcite in this study indicates that temperature seasonality in fossil ostreid bivalves may be constrained by the sequential analysis of well-preserved foliated calcite samples using this method. How to cite: de Winter, N. J., Vellekoop, J., Vorsselmans, R., Golreihan, A., Soete, J., Petersen, S. V., Meyer, K. W., Casadio, S., Speijer, R. P., and Claeys, P.: An assessment of latest Cretaceous Pycnodonte vesicularis (Lamarck, 1806) shells as records for palaeoseasonality: a multi-proxy investigation, Clim. Past, 14, 725-749, https://doi.org/10.5194/cp-14-725-2018, 2018.